I finished shooting the main bulk of my latest short film, Unto Death, a few months ago now, but there was one shot that kept eluding me. 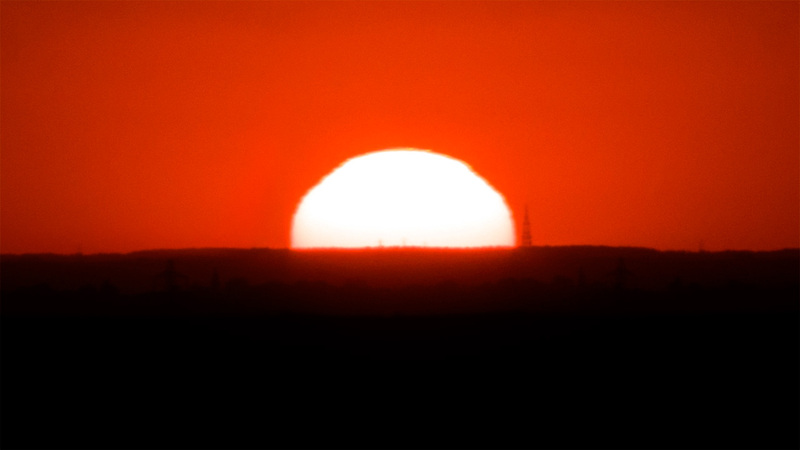 I desperately wanted a telephoto shot of the setting sun, specifically the sun disappearing below the horizon. I tried various locations all around South London but was constantly foiled by weather, on one occasion the only cloud in the sky was exactly in front of the sun. Sod's Law! Also, it sounds stupid, but I really underestimated just how bright the sun is even when it's at its least powerful and beginning to fade. Stopping down my lens to f/32 was nowhere near enough so I bought some ND filters for my Cokin filter holder. Finally after two months of attempts the weather was perfect and I had the correct equipment for the job. It only lasts a few seconds in the film but the effort was totally worth it. Big thanks to Helen Miles for all her help. For any techies it was shot on Blackmagic Pocket in RAW with a Tokina 60-300mm at f/22 and ND16.